Boston College advanced to the Sweet 16 in dramatic fashion after Simon Enstrom scored in extra time to give the Eagles a 2-1 win over 14th-seeded University of South Florida in Sunday’s second round game at Corbett Soccer Complex in Tampa, Fla.
Enstrom, who also scored the game-winner against Vermont in the first round, received a pass from Zeiko Lewis and converted in the 98th minute. 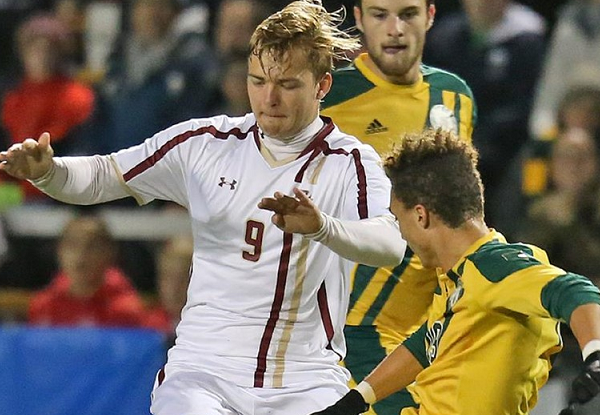 Isaac Normesinu unlocked a scoreless match in the 74th to give Boston College the edge late until the South Florida equalized on a Prosper Figbe 89th minute goal. The Eagles enjoyed a man advantage for much of the match after Bulls midfielder Lindo Mfeka was sent off in the 26th minute. With the win, the Eagles booked a third-round date against third-seeded Georgetown on Sunday in Washington, D.C. Kickoff is set for 1:00pm. While the Eagles extended their NCAA run, Connecticut and Dartmouth both bowed out of the tournament in their respective second-round clashes on Sunday. The Huskies fell 1-0 to 16th-seeded Indiana while the Big Green succumbed 2-1 to sixth-seeded Syracuse. ← Previous Story NCAA: BC, UConn & Dartmouth Advance to 2nd Rd.